Cardboard Popharpe were perfected by Véronique Musson-Gonneaud and Pascal Bernard in 2010. In 2016, they were awarded the Prime Minister Prize during the 115th Paris International « Concours Lepine ». Cardboard popharps combine optimal tone with a very low cost. The success of these instruments is due to the dynamism they create : a relation to music based on exchange, simplicity, training, the art of compromise and creation. 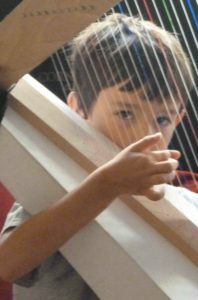 They are the means of a global pedagogical project for making it possible for most people to play the harp :it is a musician’s answer to alternative economic and social challenges which question music training today. People don’t buy cardboard harps, they are assembled during a training session. They can be taken everywhere because of their light weight( 2,5kg) and smale size (110cm). Each cardboard harp is unique, you can decorate it according to your whish at the end of the session. Owing to their 24 strings (from A1 to C5) they covered a wide tessitura with enough bass to be able to explore music. Half-steps are obtained manually according to techniques used in the Middle Ages. Alternative tuning modes with added strings are also possible for people who whish to tackle 14th to 16 th century repertoire. Even though they have some things in common, the cardboard popharps are not improvised instruments. On the contrary , they are among the precursors of the Frugal Innovation movement in the music industry. This is an ecocomic movement which tries to accomplish more with smaller means. Even though these harps appear to be simple instruments, they are the fruit of a long period of reflexion and experimentation. The results have been very satisfaying. They formed part of an exhibition at the engineering school « l’Ecole d’Ingénieurs de Metz » in January 2017. 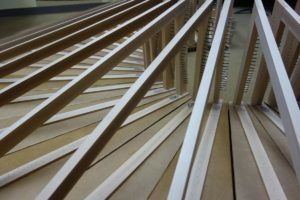 The cardboard popharps were born from the innovative idea that the quality of sound depends more upon the highly precise calibration of the gauge( diameter) and the length of each string, than on the material of which soundboards is made. Once this was established , the rest was just a question of refining theory through experience. What repertory can be played by cardboards Popharps ? The cardboard popharp is above all a simple harp. They resemble the diatonic harps that have always coexisted beside more elaborate instruments, like double and triple harps, lever harps or pedal harps. The repertory is therefore the same as that of early harps. 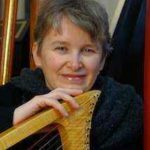 The repertory of the 14th to the 16th centuries is well known, and our cardboard harps can be used to play the same music as the simple harps from the end of the Middle Ages and the begining of the Renaissance especially in chamber music groups. Even though medieval harps had braypins to cause all the strings to buzz and cardboards harps do not, these braypins are not often used when the music of this period is performed today. 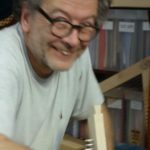 Therefore, the cardboard popharps have a tone, a touch and other qualities that make close to the « gothic harps » as they have been constructed by harp makers for the past 30 years. Beginning with the 16th century, althought simple harps were still used, we don’t yet know muuch about their repertory. These instruments were more popular, more common and certainly more often played than their complex sisters. Limited to the diatonic scale(s), simple harps obviously could’nt have the same expressive possibilities as, for example, triple harps. Neverthless, different types of harps have always coexisted. The repertory and use of simple harps is, in our opinion an important subject for musicological research and teaching techniques which be explored today. 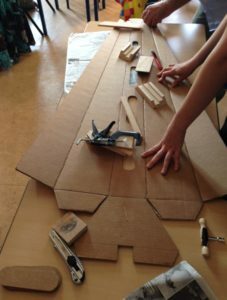 The use of cardboard popharp today requires us to take on the harp repertory, as with all living music, by taking into consideration the limits of the instruments, with the arts of appropriation, improvisation, adaptation and arrangement. Cardboard popharps work perfectly well for traditional music, and contempory popular music, as long as they don’t use everynote in the chromatic scale ! Collections and individual works editied specifically for cardboard popharps are beginning to appear ( lien). However, our belief is that everyone, at their own level, using the instruments they have, concreate their own arrangements and adaptations. We are developing teaching tools and methodologies for this, seeking the greatest possible clarity for these publications. To popularize the harp by making it possible for everyone to learn. To stimulate the creation, composition and editing of quality music which is accessible to beginners and amateurs. To develop a new form of ensemble work, which is both ambitious and demanding. To replace, when necessary, the Medieval or Renaissance harp for beginning students of these instruments. … and a model to inspire…. The first cardboard harps were designed by the American Denis Waring in the 1970’s. Since then, numerous other makers have been interested in the concept. We’ve use dit to return so-called « simple » harps (without levers or double strings) to the consideration they deserve, especially reproductions of early harps whose use and repertories have not been thoroughly studied or understood, but which have much to offer teachers of amateur musicians. We have thus created innovative instruments respecting the musical requirements of historical examples : wide range, base notes, the distance between and flexibility of the strings, the technique for playing half-steps, strong clear sound, balanced tone and touch. I’m a carpenter and in the beginning I didn’t believe in cardboard. But our first attemps convinced me in spite of myself !Instrument making is refined woodwork. 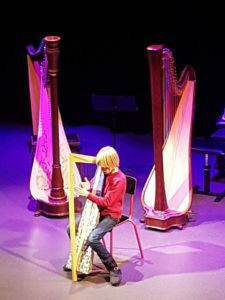 However, we chose simplicity in our materials so that everyone can personalise our harps, understand how they are constructed and why they have a good sound. But it’s not easy to design things that seem simple ! You have to master the construction to be inventive, and be inventive to be successful !